A new term means new staff for President Obama. 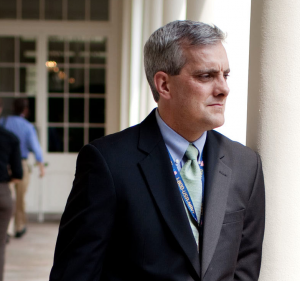 Among the changes, the President is naming deputy national security advisor Denis McDonough as his new chief of staff. McDonough will replace Jack Lew who is nominated to replace Timothy Geithner for Secretary of Treasury. McDonough who is 43 years old has been a key advisor to President Obama since the Commander-in-Chief was a newly-elected Senator. His accomplishments in national security include advising the administration to bring troops home from the Middle East. Also McDonough was in the room with the President when U.S. raids killed Osama Bin Laden. President Obama has counted McDonough as one of his most trusted advisors and thinks he can lead the administration forward. McDonough will be the President’s fourth chief of staff. He was preceded by Lew, Rahm Emanuel and William Daley. Legislative affairs director Rob Nabors will become the deputy chief of staff.